I had the distinct pleasure of heading to Rabbit’s Foot Meadery in the Sunnyvale, CA earlier this week to sample the local meads, cysers and braggots that they produce in house. The Rabbit’s Foot Meadery was founded in 1995 and has been producing award winning mead ever since. Unfortunately the founders were not in house when I showed up for my mead tasting, so I was unable to speak with them directly. Fortunately though I was able to sample a selection of their excellent product. A mead is a fermented beverage made by using honey for at least 66% of the fermentable sugars. A typical recipe calls for a simple blend of water and 10-15 lbs of honey for a 5 gallon batch, with the addition of a yeast strain to ferment the sugars, the most common in my experience is a champagne yeast. A cyser is a similar to a mead with apple juice or apple cider being substituted either wholly or in part for some fo the water used in typical mead production. A braggot is the use of honey in a beer recipe, where honey represents 30-66% of the sugars with the remaining fermentable sugars coming from barley or other typical beer sugars. The Rabbit’s Foot Meadery is one short block off the Winchester – Mountain View light rail, and nestled between 237 and 101 just off Tasman, at 1246 Birchwood Drive. It is very hard to pick out from the street and I had to keep referencing my phone and the posted addresses to be able to find it. Unfortunately the meadery was very crowded and I did not want to ask for permission from everyone there before taking a picture, so I only have pictures from the entrance and of a few of the individual samples. The entrance proudly displays the awards which their meads, cysers, and braggots have won over the years. Unfortunately they were out of both War Hammer and Melia, but I was able to sample their brand new braggot, a Honey Stout. So, without further ado, let’s move on to the meads, cysers, and braggots that they had available for sampling. The tasting, which was surprisingly inexpensive started with the two house meads, the sweet mead and the raspberry mead. Unlike many sweet meads that are back sweetened (additional honey is added in after fermentation to sweeten them), Rabbit’s Foot first cold crashes their mead (quickly lowering the temperature of the mead to stop fermentation and make the yeast drop to the bottom) and then they filter it through a .5 micron filter in an attempt to stop fermentation while the mead it still sweet without the need back sweeten. For the sweet mead they use a jasmine honey. The sweet mead is light gold in color with a very thin white head; yes it’s carbonated because the owners decided after a couple years that they preferred their sparkling mead. The aroma is sweet with blackberry and floral notes. The mead is light to medium bodied with a sweet vanilla and floral flavor. It is very refreshing and with a smooth finish. The raspberry mead is dark pink in color with a very thin white head. It has sweet raspberry aromas with a flavor that follows through with more of the same. It is slightly tart, slightly sweet and definitely an excellent example of a melomel (fruit mead). Tonight’s post is getting rather long so I am going to follow up tomorrow with write-ups on the cyser and braggot. 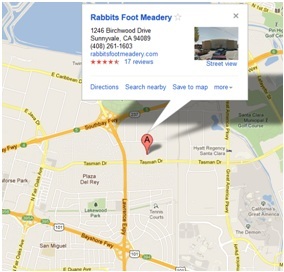 So, stay tuned tomorrow night for the rest of the write-up on Rabbit’s Foot Meadery! That’s all for tonight! Happy Drinking!